• More page management options: Duplicate or name your pages. Pages now stay open while you sync. 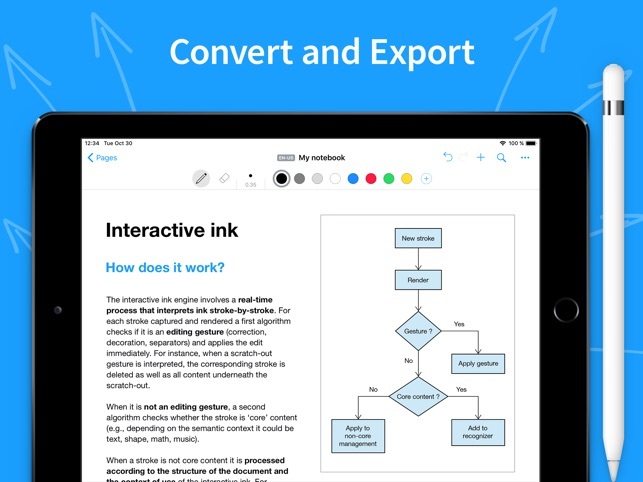 • Enhanced writing experience: Benefit from the latest innovations in MyScript Interactive Ink. • Simpler recognition language settings: Easily update recognition languages right from the app settings. South African English is now also recognized. 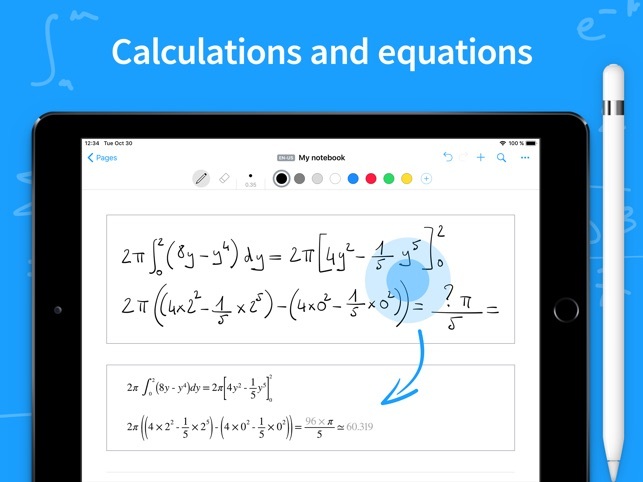 Our iPad Pro becomes an awesome on-the-fly notepad with this app built specifically for Apple Pencil. 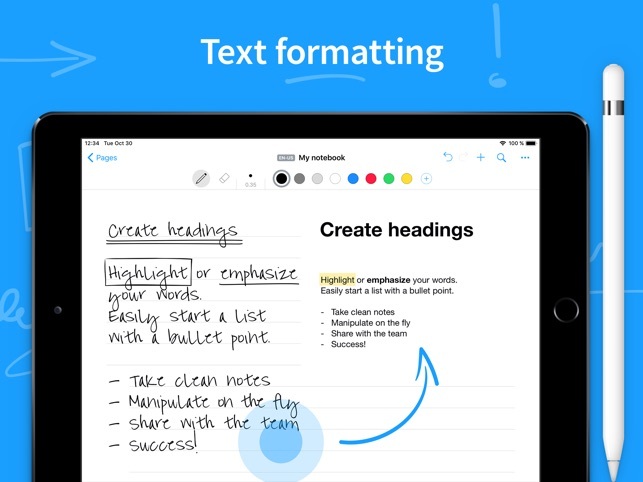 With a few taps and strokes, we can format handwritten text as titles, paragraphs, or bulletpoints. 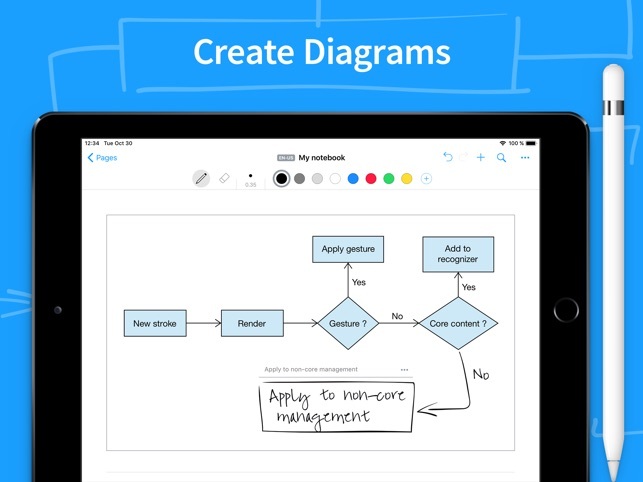 And creating diagrams or marking up photos? Dead simple. Ah, the simple joy of taking old-fashioned notes—and decorating the page with random doodles! The handwriting recognition works as well as any app I’ve tried on an iPad Pro. But the lack of iCloud sync is a big inconvenience. If you have your other Apple devices set up to use iCloud sync, then Nebo's separate “cloud sync”is a cumbersome set of extra steps, requiring additional user IDs/accounts, and external services that would all be seamless if the app just supported iCloud. Disappointing for an otherwise well-designed app. 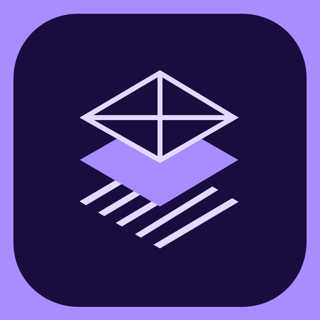 I tried out this app and GoodNotes, and ultimately this one won out because it works so much better for the way I want to write. I didn’t have to adapt very much to get this app to work for me. 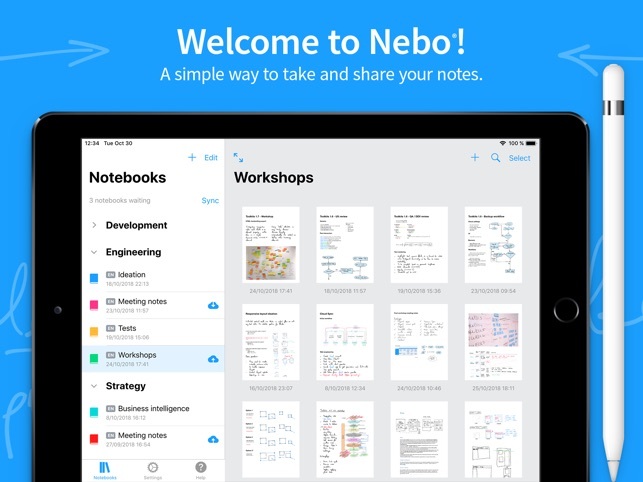 I take tons of lecture notes and I needed something searchable that allowed me to write as quickly as I hear it and have the app recognize what I’m writing. The handwriting recognition is pretty remarkable, especially taking into account just how bad my handwriting is. That said, this app isn’t GREAT. It is missing two pretty key and important and basic tools that may shorten the amount of time I use it. One: there is no copy/paste feature, either of what I’ve written or what I found elsewhere to add to my notes. I have to write in everything from URLs to text from web pages to bits of other notes. That’s really annoying. Two: I can’t type in this app. I would like to be able to add a text box and type in it sometimes. The addition of those two tools would make this app one of the better app experiences you’ll find *period*. But as is, it’s still darn good and well worth the money.